ACHEON Project | EU FP7 ACHEON Project Blog. EU FP7 ACHEON Project Blog. The official ACHEON Project Website is Online now. ACHEON project has been submitted on October 25, 2011. It was the deadline for this Level 0 Project on breakthrought innovations in air Transport. We hope in a large consesus in social media and web to sustain this project oriented to much greener Aeronautics. Jet deflection systems are important to define novel concepts of air vehicle with enhanced performances, manoeuvrability shorter take off and landing spaces: It will permit to explore radical new concept of aerial vehicle and to give a realization to some very advanced concepts which have been intuited during the history of aviation but couldn’t be applied because of the absence of effective and affordable jet vectoring system. – experiencing novel propulsive which can reduce the emission greenhouse gasses such as electrical turbofan, which can be alimented by renewable or photovoltaic electricity. It has been demonstrated by the experiences matured along last 4/5 decades that control based on sophisticated mechanical systems can be suitable for military combat planes and for very short operational periods (combat flight), because they lack in term of affordability and safety. The integration of HOMER nozzle concept with an active control system such as PEACE can have a disruptive potential of innovation. HOMER overcomes the traditional limitations of common Coanda effect Nozzles with an active enhancement and control of adhesion by control jet. PEACE introduces instead an effective low cost control system and easily to integrate control system which can introduce a more effective governability of the system. By coupling two elements that can produce by themselves an effective innovation it is possible to generate something that can produce disruptive innovations. The key element to define a decisive breakthrough by using this propulsive system is related to the definition of novel aerial vehicle architectures which can take the maximum advantage from the HOMER nozzle by PEACE control system lead opens new possibilities through a more easy and controllable effectively uses of Coanda effect. By these considerations ACHEON project (which mix together the two outstanding themes of research) has been conceived. In particular different architectures with different operational models can be tested and verified both by CFD simulation (to identify best operative solutions) and by testing models of the most promising in order to acquire the necessary operative experiences which can accelerate further investigations on the system. In particular different nozzle designs can be tested to verify if a similar propulsive concept with direction control of the propelling jet could be implemented on well tested air vehicle architectures and could gradually lead to effectively optimized future air vehicle concepts which can maximize the benefits of this kind of nozzle and the consequent jet directionality. The HOMER nozzle presents a related security problem related to the failure of one of the high speed sources, and in this case it presents a problem related to permanent flux direction. The application of the PEACE electrostatic control will produce effective control not only of adhesion angle but also of rectifying the outlet jet in the case of a primitive source failure. In particular the project aims to investigate different configurations and different uses of this propulsive system with trust direction control capability. Different aircraft architectures will be investigated both by CFD simulation and experimental tests. In particular this test activity will be performed on different architectures and design concepts which can have significant advantages by the proposed propulsive architecture. The second IDEA originating the ACHEON project is in the PEACE system which is in a very preliminary stage of development. It is the PEACE project started at Universidade da Beira Interior. PEACE is the acronym of Plasma Enhanced Actuator for Coanda Effect. PEACE aims to produce an active control of the Coanda adhesion to a surface by means of the BSD technology (Dielectric Barrier Discharge) which can enhance and control adhesion of the syntetic by an active control system. 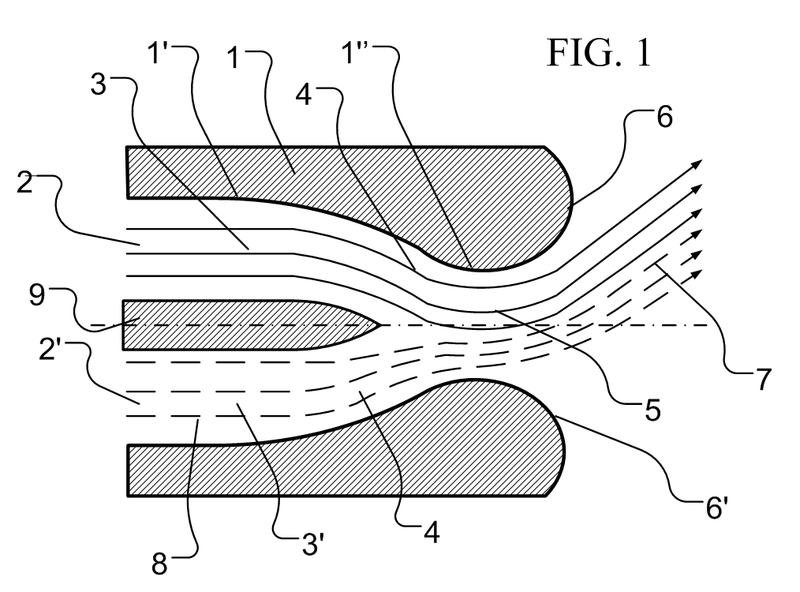 A plasma actuator consists of two offset thin electrodes that are separated by a layer of dielectric insulator material (Figure 2). One electrode is exposed to the air. The other is fully covered by a dielectric material. 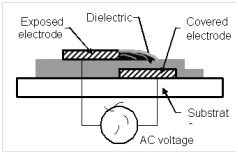 The electrode exposed to air is assumed to be loaded by a high voltage, whereas an electrode buried under the dielectric is expected to be grounded. A high voltage ac potential (high-amplitude (several kV) and high-frequency (typically several kHz) AC voltage) is supplied to the electrodes. This effect permit a partial ionization in the region of the largest electric potential, which usually begins at the edge of the electrode that is exposed to the air, and spreads out over the area projected by the covered electrode. The ionized air (plasma) in presence of the electric field produces an attraction/repulsion on the surrounding air. Ionized particles are accelerated and transmit their momentum, through collision, to the neutral air particles in the plasma region over the covered electrode. The result is an acceleration of the air in proximity of the surface of the dielectric. This technology permits an active control on the Coanda effect by means of a very simple system with very high advantages against Coanda adhesion control by control jets. – possible modulation in terms of frequency and of power variations. H.O.M.E.R. nozzle concept produces a fully controllable flux, with the ability to maintain a predefined direction and to change this direction arbitrarily as a function of momentum (or velocity) of two primitive streams and of the geometric configuration of the nozzle itself. Figure 1 shows the architecture of the nozzle. It can have any arbitrary geometry as long as it is constituted by a duct (1) eventually bipartite into two channels by a central septum. The two channels converge into the nozzle outlet, connected to two Coanda surfaces (3) and (3’). This nozzle is different, more rational and simple than any other jet vector system ever conceived before. It has the ability to permit the stabilization of a synthetic jet with an arbitrary predefined direction and to modify this direction dynamically without any moving mechanical part. It generates a vectored and controllable jet by the combined action of two different physical phenomena: the mixing of two primitive jets (2) and (2′) and the angular deviation of the resulting synthetic jet by adhesion to the Coanda surfaces (3) and (3’). The synthetic jet is generated and governed by two primitive jets (2) and (2’) by varying their momentums. Physical quantities which guarantee the controllability of the deflection angle of the synthetic jets are the momentum – or speed, for homogeneous jets – and geometric dimensions and design of the nozzle. Minimal operating condition are related to the Reynolds number (Re > 5000) of the synthetic jet (4) in correspondence to the nozzle outlet. In case of lower Reynolds numbers the system behavior is unpredictable. – if momentums are equal the synthetic jet is straight aligned with the nozzle axis. The angle formed by the synthetic jet (4) and the geometrical axis of the nozzle can be controlled by the momentums of the primitive jets (2) and (2’). It can be increased when the difference between the moments of the two primitive jets (2) and (2′) increases, can be decreased when it decreases and becomes null when it is zero. The ACHEON project aims to explore a novel propulsive system for aerial vehicle which overcome the main limitations of traditional aerial propulsion systems introducing an effective system for an effective and affordable vectored jet aerial propulsion system with no part in movement. This project aims to overcome well known limits related to commonly known jet deflection system and his passed on an Italian patent presented by University of Modena and Reggio Emilia. Coanda effect of adhesion of an high speed jet to a convex surface. – Elevated affordability because the deflection of the jet is realized without any moving part. – Easiness of control because the angle formed by the jet and the nozzle axis can be regulated only by varying the velocity of two incoming jets. – Possibility to be alimented by turbofan or jet propulsion systems and regulated by angular velocity of the applied propulsion system. – Exploration of more radical and innovative concepts: many future applications can benefit by an affordable and simple jet deviation and thrust vectoring opening new more radical scenarios of innovation for future aeronautics. – innovative aerial vehicles concepts optimized for vectoring propulsion systems.